…on ModCloth, the online retailer and my guilty pleasure. On the Tracy Reese website all sizes but 4, 6 and 12 had sold out by 3:30 am the early morning after they went on sale. By 10:45 pm however, it looks like Reese ordered a new batch of dresses for production as now the dress is available in all sizes from 0 -14. ModCloth, however, is still out of stock. 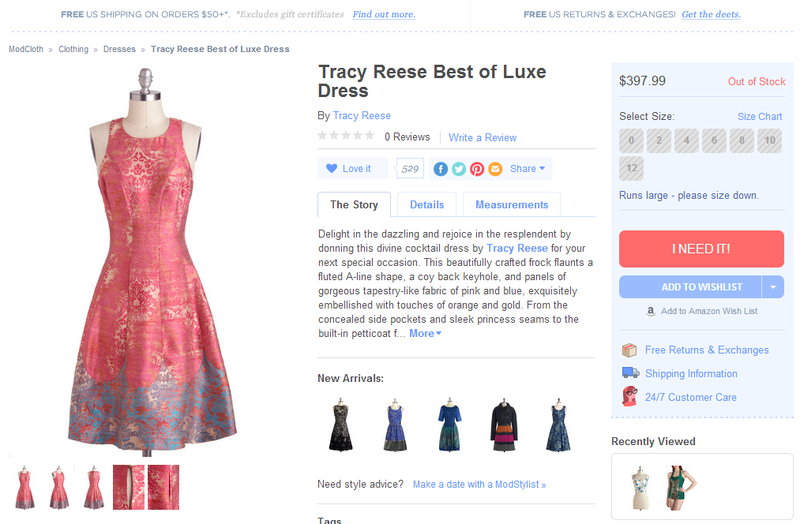 The official name of the dress, according to the Tracy Reese website is “Pink Wallpaper Combo Frock.” Really boring, and borderline horrible of a name, if I must say. Best of Luxe is a rayon/silk mixture though, so not really the best of “being elegantly sumptuous.” Despite the exaggeration of luxury, the ModCloth name implies that while wearing the dress, you then become the best at being elegantly sumptuous. Which again, is better than wearing wallpaper.